Scott McLaughlin bounced back from his Saturday evening non-start to win the final leg of the Beaurepaires Melbourne 400, as Chaz Mostert secured the Larry Perkins Trophy. McLaughlin’s perfect record in 2019 came to an end when he failed to start Race 5 after a collision with Cameron Waters on their way to the grid. Mostert won that race and started the final from ARMOR ALL Pole, but had to settle for second behind McLaughlin. Jamie Whincup rounded out the podium in Sunday’s sprint, while Mostert won the Larry Perkins Trophy after top-scoring the weekend. McLaughlin got the better of Mostert off the start, with the Supercheap Auto Mustang having to slot into third behind Whincup. It took until lap three for Mostert to get past Whincup’s Commodore, at Turn 3, by which time McLaughlin was two seconds clear at the front. The race was neutralised the next time around, to recover Macauley Jones’ stricken Team CoolDrive Commodore from Turn 9. It resumed with five laps remaining and Mostert able to go with McLaughlin but unable to get within half-a-second. In the end, Shell V-Power Racing’s McLaughlin took his fifth win of 2019 by 0.8042 seconds to extend his championship lead. “I don’t count we started yesterday’s race, so let’s go five from five,” McLaughlin laughed. “I feel like I’m nailing those starts which is making me feel really good and I had a really good run into Turn 1 there with Chaz. “I’m just stoked for everyone at Shell V-Power Racing and Ford Performance, just a great start to our year and we’ll press on. Asked of overcoming Saturday’s disappointment, he added: “You can’t dwell on it, you’ve got to focus and get on with things. 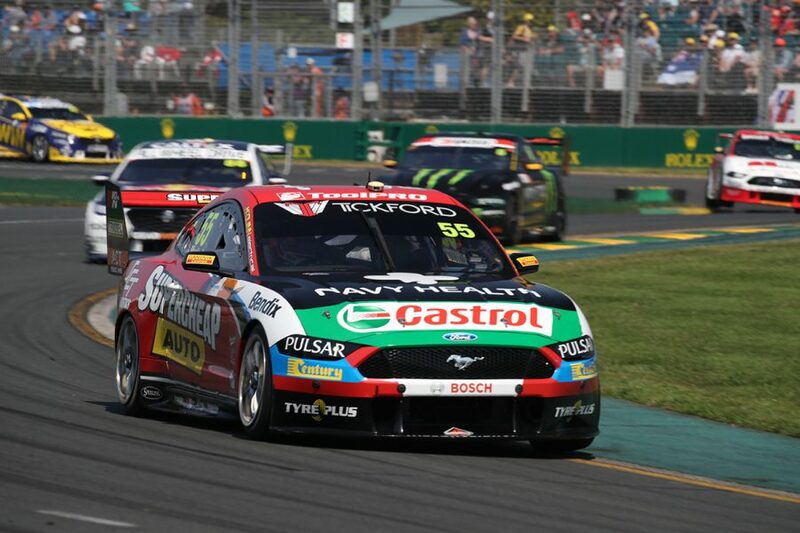 Second for Mostert made it three podiums from the Albert Park weekend’s four races, accompanied by fifth in the opener. “The car is pretty good in race trim, now we’ve just got to dial it up a bit for quali for the next round,” Mostert said. “Overall super-pumped. To get the Larry Perkins award is pretty cool. Whincup was a further three seconds to secure his 200th Supercars podium. The 2018 winner wound up second in the Larry Perkins Trophy points, and is McLaughlin’s closest championship challenger, 31 adrift. Tickford pair Cameron Waters and Will Davison rounded out Sunday’s top five that included four Mustangs. Mark Winterbottom, Tim Slade and David Reynolds occupied sixth, seventh and eighth, ahead of Lee Holdsworth and Scott Pye. Shane van Gisbergen started fifth but lost ground through the early stages, and a fight with Fabian Coulthard ended with contact at Turn 13 on lap two. Coulthard fell to 22nd and eventually finished 15th, while van Gisbergen was handed a 15-second time penalty, falling from 13th to end a troubled weekend 22nd. As part of his sanctions for a run-in with Lee Holdsworth on Saturday evening, Richie Stanaway started from pitlane and finished 22nd. Rookie Jones was fired into the fence at Turn 9 while fighting the Kelly Racing Nissans of Simona De Silvestro and Garry Jacobson on lap four. Overlap between the rear of Jones’ Commodore and the front of Jacobson’s Altima spun Jones into the wall, bringing out the Safety Car.